Gender matters, because people instinctively react to you differently based on your gender presentation. As much as I wish I could argue that gender doesn’t matter, as I tried to do for so long before I finally came out as transgender, I can’t. It affects every aspect of how people react to you. Transitioning is incredibly eye opening, because you can learn first hand the difference in how people act based on something as simple as your gender presentation. No, I did not use quotation marks for emphasis. The “issue” I am talking about in this blog post is entirely fictitious. It is a figment of the imagination that has somehow metastasized into the realm of political discourse, and further into the real world, as in the case of the dumpster fire that is North Carolina. Bathroom bills are an attempt to solve a problem that exists only in the minds of transphobes. The idea that we need bathroom bills to protect innocent people from transgender people is laughable. That is even ignoring the fact that a law to define who can use which bathroom is an entirely laughable subject by itself. Or at least those ideas would be laughable if bills weren’t being proposed all over the place. As I said in my post about deadnames, there isn’t a distinct line that can be drawn that marks the start and end of my transition. The day that I first started questioning my gender is too nebulous. I look back on the day that I first came out to my then girlfriend with sadness and regret. The day I came out to my wife for good is another possible marker, but even that was more a day of fear and trepidation than one to celebrate. How about the first day of therapy? Well, that’s going to be the subject of another post, but it doesn’t feel like a major step in my transition that should be celebrated. The day most transgender people celebrate, myself included, is the day they started hormone replacement therapy (HRT). I’m coming up on one year of HRT. I wanted to do something to commemorate the event and memorialize the past year of my life, so I got a tattoo. 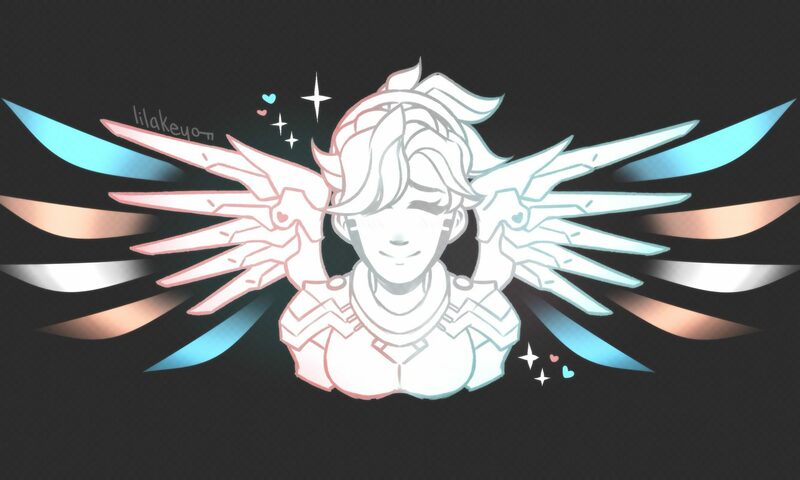 Pictured is Mercy from Overwatch with feathers the color of the transgender pride flag. I’m so incredibly happy with how it turned out. It’s beautiful, and will always remind myself of this past year. For as long as I have been questioning my gender, if not longer, I’ve been questioning my sexuality. That isn’t to say that the two are correlated with one another, because they’re not, but more that as I grew up and became more worldly minded, I started questioning my own perceptions of the world. This questioning included my views on religion, politics, and yes, gender and sexuality as well. I hate the term deadname. I hate the images it brings up. I hate the connotations that it has. I hate everything about it. That isn’t to say there’s not a place for it in transgender discourse, or that other transgender people can’t find solace in that same term, images, and connotations. In fact, I still use the term a lot, more so now than when I first came out. It does the job that it’s set out to do, which is to define very succinctly what calling someone who is transgender by their non-preferred name feels like, and why it shouldn’t ever be done. The very term sounds grave, because it is. Imposter syndrome, according to Wikipedia, is the “concept describing individuals who are marked by an inability to internalize their accomplishments and a persistent fear of being exposed as a “fraud.”” Usually it is a term used in professional contexts, but I can guarantee most, if not all, transgender people experience their own symptoms of imposter syndrome. The feeling of not truly being the gender they identify with is a struggle that every transgender person must deal with. It begins from the very first moments of questioning one’s gender, and I’m not convinced that it will ever fully go away. I feel like I will always have moments where I question whether I truly count as a woman. I came out to my girlfriend of 3 months, at the time, as questioning my gender. Her reaction was an immediate “what does this mean for me?” and “what does this mean for our relationship?” It was the first time I had spoken my issues out loud, let alone to another human being. I immediately retreated into my closet full of “I could never actually transition” and “I have a career/life/family I can’t possibly be transition” and “I’m too old to transition” and a side dose of “I like girls I obviously can’t be a girl myself because I’m not gay”, reassured her that everything was fine, and we didn’t speak of it again.